Jay McCarthy throw a personal best at the Scottish Indoor Under 15 Championships, breaking the 12 metre mark to pick up the silver medal with 12.07m. Michael Conteh, running in his first Scottish Championships, had a really busy day with 3 200m’s races in two hours with the reward of finishing 5th in the final, running a PB in the Semi-final of 25.63. His brother, Maynard, not to be outdone ran a PB of 8.44 in the 60m. Ruairidh Campbell also ran a PB of 28.06 in the 200m. Johnny Burns returning from injury ran 2.28.22 in the 800m with Jessica Grant recorded 2.46.73 in her 800m. On Saturday saw Matthew Fox run a PB of 2.44.36 in the Under 13 800m. Well done everyone. 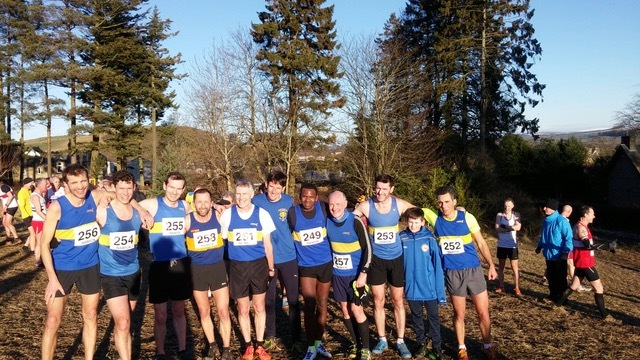 The venue for the 2019 Masters Cross Country Championships was Hawick in the Scottish Borders. Athletes would have remembered the last visit to Hawick when a number of athletes were taken to hospital with exposure. With a cold but bright day there was no danger of this in 2019. Jethro Lennox was going for 3 in a row titles but the fast ,hard course did not suit Jethro and he had to settle for the bronze this year. He lead home a large group of Shettleston athletes who had made the journey to the Scottish Borders with team success in the form of a silver team medal in the M40 age group .The M50 -60 just missed out on a medal, finishing 4th . On Sunday saw some of our younger members taking the chance to compete over a cross country race at the Springburn Schools Cross Country Races. While no official results are available as yet we have heard that Erin Ellor finished 1st with Jay Simpson just outside the medals in 4th place. Well done to everyone that ran.